Jim Stouder, left, and Josh Wheeler of Benton County Public Works chat with four people who showed up for a community meeting at North Albany Middle School Thursday night. Road maintenance may not be the sexiest subject. 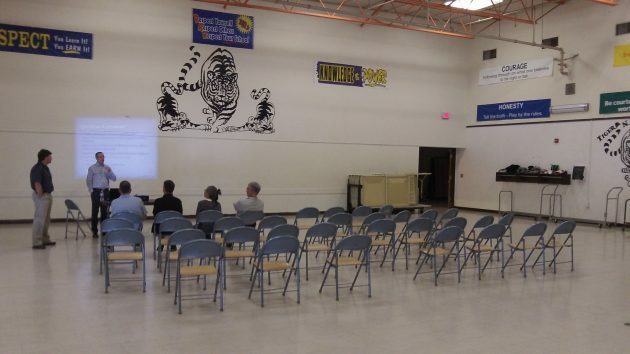 Still, the handful of citizens who showed up for Thursday night’s “community event and open house” on Benton County transportation came away with useful things to know. The main thing is that Benton County has plans for several road projects affecting North Albany residents and commuters, including bicycle riders. One is that this summer and next, a stretch of Independence Highway from the railroad tracks north will get an asphalt overlay and some additional width to accommodate bike lanes. A couple of segments will be done this summer, and the part in between is scheduled for next year. As part of that job the county plans to improve sight lines at the T-junction of Ryals Avenue and Independence, where the topography now keeps drivers from seeing approaching cars. Also set this summer: An asphalt overlay of Robin Hood Drive in North Albany, plus a bridge replacement and several other pavement overlays in other parts of the county. Among more than a dozen projects countywide for 2017 or ’18, Benton has plans to reconstruct Gibson Hill Road and Crocker Lane before turning jurisdiction over to the city of Albany. Also under design for that time frame is the widening of sections of Oak Grove, Metge and Ryals, to go along with the work on Independence. There are virtually no shoulders on those roads, and cyclists necessarily ride in the traffic lane. Public Works Director Josh Wheeler says the idea is to provide a safer bike connection between the Albany and Corvallis areas, even though it’s not a straight shot. Two North Albany streets, Meadowwood and Grandview, are to get chip seal treatments in 2017-18. All of it depends on the availability of funds. A brochure I picked up at the open house says Benton County gets a little more than $4 million a year from the state gas tax. Property taxes can’t be used for road maintenance, but the commissioners have dedicated $750,000 from other general fund sources to step up chip-sealing county roads. I hope when they rebuild crocker they rebuild the whole thing, rather than leaving parts of it untouched like I’ve heard. They are only rebuilding the parts which other people are on the hook to pay for. Where was info regsrding this meeting posted? I would have attended. There are more meetings planned that you may be able to attend. Me too, Pat. Me too. Didn’t see it on the paper’s website but thx Mr. K.